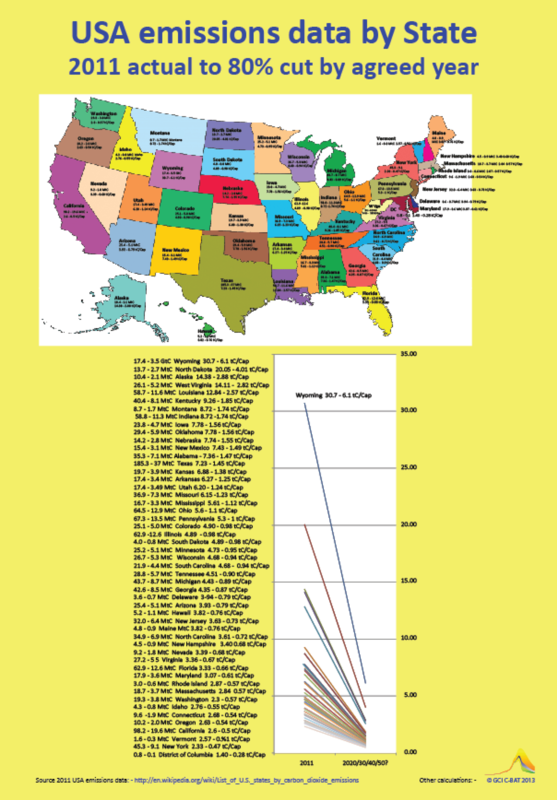 In addition to depicting state by state reductions pathways that would achieve a reduction of 80%, the numbers on this chart identify what this 80% reduction would accomplish in reducing per capita emissions in each state. As we explained in the last entry, any ghg target must implicitly make an assumption about two issues that are rarely explained. They are: (a) an assumption about what ghg emissions budget will be achieved by the target that will avoid dangerous climate change, the carbon budget assumption, and (b) a position on what distributive justice principle was followed by the government entity when the target was selected, the equity and justice assumption. Although these assumptions are implicitly made in setting any ghg emissions target, government entities usually escape expressly identifying these assumptions. Because these assumptions are key to critically reflecting on the adequacy of any ghg target, governments should be required to make their assumptions explicit about what carbon budget the target will help achieve and what principle of distributive justice the government reduction target relied in setting the ghg emissions target. This entry was posted in Atmospheric Targets, climate change ethics, climate change governence, climate ethics, General Climate Ethics and tagged climate change and morality, climate ethics, Ethics and Climate Change, Ethics and Global Warming, ethics of global warming, ghg emisions reduction levels, Ghg emisions reductions targets, global warming ethics, US media and climate change, US states and climate change by dabrown57. Bookmark the permalink.